This rare first edition set of Procession Chinois scenic wallpaper, circa 1815, was exhibited at the Winter Antiques Show in New York City. This paper was extraordinary, museum quality, in fact, and a nearly complete set of panels. At some point this wallpaper had been mounted on a folding screen by a conservationist. While the paper was in relatively good condition, the conservation process unfortunately included permanent mounting, which meant that it would be extremely difficult, if not impossible to remove and reuse the paper. Sometime later a client saw the screen at Sotheby’s and consulted with Jim and John Nalewaja about the possibility of removing the wallpaper from the screen and reinstalling it in a residence. John and Jim went to Sotheby’s and inspected the paper to evaluate the prospect of a successful removal and reinstallation. They concluded that it was a calculated risk, that the paper might disintegrate as it was removed, but that it could possibly be removed and restored with the goal of later reinstallation. The client understood the risks to fully restore the paper, and decided to move forward with the project. The client purchased the paper at auction and the hard work began. John’s removal expert worked inch by inch to separate the scenic wallpaper from the screen. The painstaking work took several months, but was ultimately very successful and the paper was preserved for restoration and later reinstallation. It was a significant achievement to save this rare and valuable paper. The details in this paper are very fine. The architectural details on the pagodas are meticulously drawn and you can see the expressions on the faces of the people in the scenes. Only in a first edition is this detail possible. This was an almost complete set of Procession Chinois, but it was missing eight panels of one desirable scene, so the decision was made to have that missing scene recreated by contemporary wallpaper artisans located in China. John and Jim researched the missing scene with their extensive collection of books on scenic wallpapers and provided detailed images of the missing scene to the artisans. But before the artisan could even begin, paper had to be sourced, which matched the original paper as closely as possible. This was a complicated process, requiring some long weeks of sourcing materials for client approval. An art shipper that has worked closely with John and Jim for many years, crated two of the antique panels and they were shipped to China so that they could be matched. The wallpaper artisans created several sample panels for review. The new paper mimicked the original joined sheets and was hand-painted in a hand-blocked style. Jim created a scale model of the room to show the location of the original paper and the recreated paper for approval by the client. The recreated panels were used over the fireplace so that all of the antique paper could be used to the fullest extent. Both the antique and new panels were eventually shipped to Chicago. 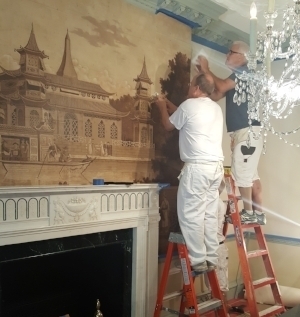 John and his assistants painstakingly re-installed this antique Procession Chinois paper in a Gold Coast Townhouse. The paper was extremely fragile because of its previous installation on the screen, but the time and care taken during removal paid off and the panels were successfully reinstalled in the new location, along with the additional section 18 months after the project began. The last step in the restoration process was art work. The artist touched up some damaged areas of the paper, extended the pattern over the doors and windows and worked on the joins between the old and new panels completing a beautiful reinstallation of this lovely antique paper.